Here is a list of a few other tour operators on Isla offering a range of tours such as fishing, boat tours, sunset tours, surfing, paddle boarding, whale shark tours, snorkeling and scuba diving. At the end of the 2nd largest Great Barrier Reef you reach Isla Mujeres and a range of reefs to explore. Ask about Isla’ s own Underwater Sculpture Museum by Jason deCaires Taylor. Contact any one of these reputable Isla Mujeres tour operators for your Isla Mujeres Tours and Activities! Every day from 10am to 6pm depending on weather conditions (rain / wind). In front of Na Balam Hotel on North Beach in Isla Mujeres. Inquire for more details. All things fishing in Isla Mujeres. Also whale shark tours during season (May – September). 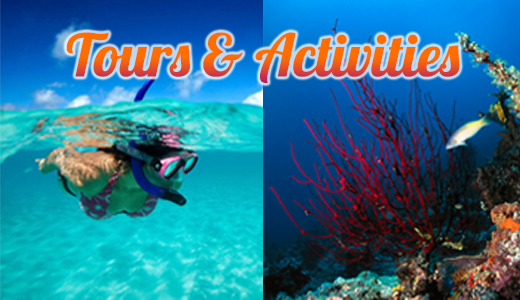 Isla Mujeres’ premier tour operator for fishing, snorkeling and whale watching trips. Fishing & boat tours. Whale Shark encounters (May – Sept). Matamoros street between Rueda Medina and Juarez Av. Next to Olivia Restaurant.